Play 7s to burn Slot Online with 500 Free Spins! 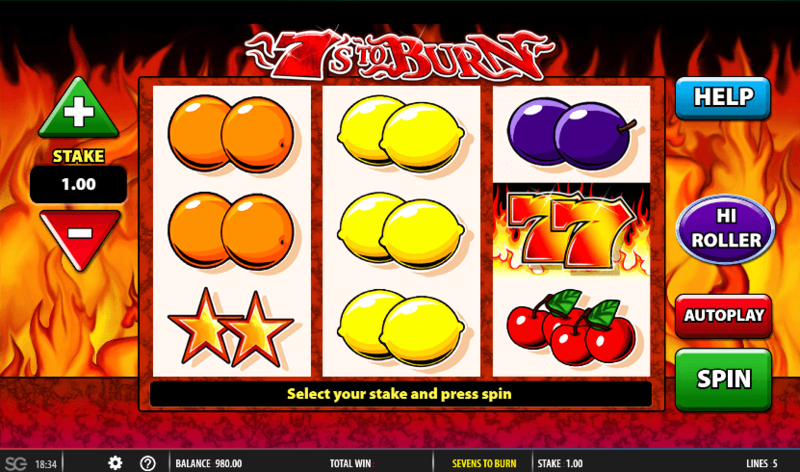 7s to Burn is a 3 reels, 5 paylines Online Slot Game by Barcrest. 7s to Burn has Wilds and Hi Roller Spins Features, and an RTP of 95.10%. The best place to play this slot is here with us at Rose Slots, where we also host more than 500 other great UK online slots including Fluffy Favourites, Starburst, Rainbow Riches and Great Rhino. If you're looking for online slots with ultra-modern HD graphics and dozens of great bonus features, you'll be pleased to know that Rose Slots has plenty of them. Just head back to our full list of online slot games and browse them to your heart's content. 7s to Burn is one for the traditionalists and those who love simple online slots done well. The UK online slots market sometimes feels crowded by flashy new slots with video content, unconventional reel and row structures and so many bonuses that you don’t understand how to trigger them, let alone play them. That’s great if you’re open to a challenge and you don’t mind spending time learning how everything works. It’s less good if you just like to dip into an online slot game for a few minutes at a time, and you prefer to know what you’re doing as soon as your chosen slot loads. 7s to Burn, which is a Barcrest product, was released in 2015. It's not old. It was designed to look as retro as it does, and harks back to a more straightforward era of playing online slots. The layout is a simple affair - three rows, three reels, and only five fixed paying lines to look for. There isn't even much in the way of a theme; it resembles an old-style fruit machine of the type you once found in the corner of a good British pub. The ‘Burn' part of its title, though, is all about fire. The background of the slot is literally on fire, and so is one of the symbols. No prizes for guessing which one. Because this is a traditional slot, the symbols are also traditional. If you're a player of a certain age, you may even become a little nostalgic when you see the familiar fruits, which include cherries, oranges, lemons, plums, and watermelons. Bells and gold stars are also present. Above them are the lucky red number 7, and the slot's titular burning red 7 which will pay out 250x your bet if you can line up three of them in a row on one spin. As well as being the most valuable symbol, the burning 7 is also a wild-of-sorts. It can only replace the ‘normal’ 7s to create new paylines in the base game. That changes if you decide to take advantage of the slot’s one optional bonus feature. We shouldn't be surprised that 7s To Burn is such a traditional slot game; it comes from one of the all-time great names in both online slots and offline slots. Barcrest has been entertaining the gaming public since 1968, and were once the best-known manufacturer of fruit and slot machines in all of Europe. They had such dominance in the market that when American gaming company IGT decides they'd like to make bigger waves across the pound, they made the purchase of Barcrest their first move in 1998. It was a well-timed more strategically. Back in 1998, we were in the very early stages of beginning to familiarize ourselves with online slot games. The internet had begun to become more common in homes, and gaming companies began to learn about the possibilities offered to them by the new format. IGT recognized the value of their new intellectual property and encouraged Barcrest to start making online slots. Barcrest's eye for tradition and style translated well to the internet age. While other developers focused on the flashy and the unusual, Barcrest worked with themes which they already knew were popular. Eventually, they struck gold with their Irish-themed slots games such as Rainbow Riches online slot and Rainbow Riches Pick N Mix slot game, which is a phenomenon in both UK Online Slots and UK physical casinos. If you walk into an amusement arcade in the UK, chances are you'll see the slot's leprechaun mascot smiling back at you from posters on the walls. We don’t expect online slots which are deliberately chasing the ‘traditional’ demographic to go big with bonus features. It would take away from the authenticity of the slot. 7s To Burn isn’t guilty of making that mistake - it has only one bonus feature to offer, and you’ll have to adjust your stake upwards if you want to take advantage of it. There are pros and cons to doing so. The feature is called Hi Roller Spins, and if you use it, it will alter the behavior of the Burning 7s symbol. Instead of only substituting for the regular 7s, it will now act as a ‘full' wild, replacing any other symbol in the slot to make winning combinations for you. Because there are so few symbols to begin with, that makes wins much more frequent. Too frequent, in fact, to make economic sense for the slot. It therefore mitigates its losses by halving the value of any winning line found during Hi Roller spins. The decision is therefore yours to take; would you prefer many more wins at a higher bet per spin or potentially higher-valued wins at a lower bet per spin? Instead of disappearing inside IGT, Barcrest’s name and reputation had become more valuable than ever. That got them noticed by Scientific Gaming - another company who wanted to establish a stronger presence in the gaming world - who bought Barcrest out from under IGT and made them their own in 2011. Just as with the last takeover, the Barcrest name lived on, and the Barcrest team pressed ahead with making new online slot games. Whether it’s a new Rainbow Riches slot, a traditionally-focused slot like 7s To Burn which feels spiritually linked to their 1960s origins, or something completely different, you can generally rely on Barcrest’s years of experience to provide you with an excellent time when you’re playing one of their creations.